Selected publications of the National Speleological Society are available through MSA and are listed below. 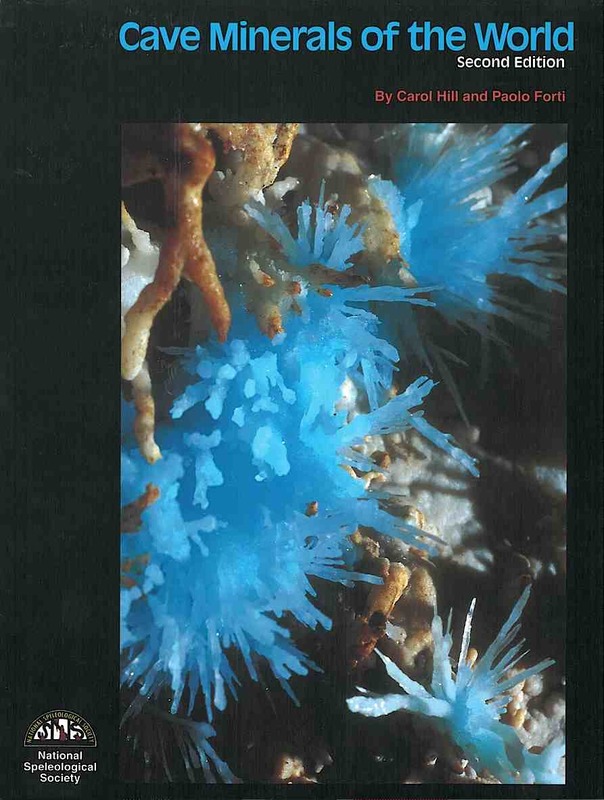 Cave Minerals of the World, second edition, is a book about cave minerals and speleothems. A "speleothem" is a secondary mineral deposit formed by a physico-chemical reaction from a primary mineral within the cave environment. The term speleothem refers to the mode of occurrence of a mineral and not to its composition. In this second edition, the classification of speleothems is based primarily on morphology (i.e., what the speleothem looks like) and secondarily on origin and crystallography (fabric). Speleothems are divided into types, subtypes, and varieties and the rationalization for this three-fold division is explained. Thirty-eight "official" speleothem types (e.g., stalactites, stalagmites, helictites) are identified and described. These types are presented in alphabetical order (i.e., starting with anthodites and ending with tubes). Subtypes and varieties of types are described within each type section. A "cave mineral" is a homogeneous solid having a definite chemical composition and ordered atomic arrangement which naturally occurs in a cave (a human-size or larger void). Over 250 cave minerals are described in this second edition. Cave minerals have been classified according to Dana's System of Mineralogy: native elements, sulfides, oxide-hydroxides, halides, arsenates, borates, carbonates, nitrates, phosphates, silicates, sulfates, vanadates, and organic minerals. Minerals within each of these classes are arranged into common and other categories, and then listed alphabetically within each category. No attempt is made to classify cave minerals by their origin because oftentimes these can have many origins in different karst settings. At the beginning of each class is a discussion on the deposition and stability of those minerals within the class. These discussions are intended to educate the reader as to why these minerals have formed in the cave environment. Cave Minerals of the World also contains a section on Related Forms - deposits that resemble speleothems but which are not actually composed of mineral species. These include lava formations, mud and sand formations, mud and clay vermiculations, organic formations, peat formations, rootsicles, formations in artifical "caves," carbide-derived formations, and guano-fire minerals. This book is intended for cavers and mineralogists alike. Cavers will especially enjoy the color photography - at least one photo of each speleothem type is included. The professional mineralogist will find the Bibliography useful: almost 4500 references are included, an estimated 95% of all the articles ever written on cave minerals anywhere in the world. The glossary is intended to be helpful for new cavers who are not familiar with the mineralogical and speleological terms used by "old time" cavers. The authors hope that all who read this book will uphold the conservation ethic of the National Speleological Society and other speleological associations worldwide: Enjoy the beautiful speleothems and minerals within caves, but leave them in the cave for others to enjoy.